A Washington, D.C.-based secular organization has sent a complaint to a Georgia school district over its high school having a stone statue that has religious statements including Bible verses listed on it. The American Humanist Association sent the Madison County School District a letter of complaint regarding the statue, which is at the school district's high school. Sent to Madison County Superintendent Allen McCannon and Madison High School Principal George Bullock, the letter said the statue violates the Establishment Clause. "It is our understanding that sometime during this school year, the school district erected a large permanent sculpture entitled the 'Red Raider' monument, on school property, which includes prominent religious, and indeed, Christian biblical references," read the letter. 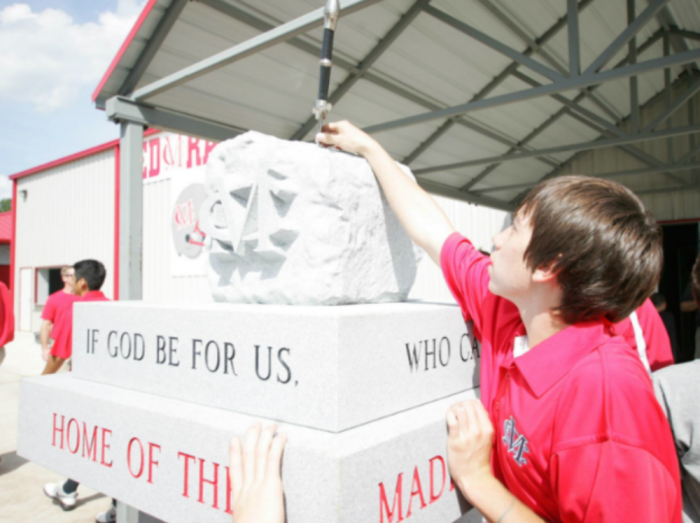 "Since it has been erected, the Madison High School football team has started a tradition of touching the sculpture before home games." David Niose, legal director of AHA, told The Christian Post that his organization learned about the statue "via email and social media" from "numerous people from the area." "We are waiting for a response," added Niose, who sent the letter Thursday requesting a response within two weeks of its delivery. Erected last month, the granite statue has multiple Bible verses listed on its frame and a tradition has already developed among the football team of touching the statue before going onto the field. The statue, which also includes the high school initial and is topped with a sword within a stone a la Excalibur, was reportedly funded privately and given as a gift to the school. The AHA is not the only atheist organization that has brought a complaint before Madison County regarding the granite statue. The Madison, Wisconsin-based Freedom From Religion Foundation sent a separate letter to the school district last month. "If schools cannot display the Ten Commandments, which are themselves Bible quotes … schools cannot display other Bible quotes alone," read the FFRF letter. "In recognition of the district's constitutional obligation to remain neutral toward religion, please remove the Bible quotes from the monument and any other religious messages posted on district property." In an interview with local media, Superintendent McCannon said that the school district had read the letters and was "investigating options available to it regarding the monument including, but not limited to, removal of the monument or modifying the monument in some manner."